The Look For Less: Velvet — designs by human. Velvet has been a very popular trend over the past year or so (also one of our personal favorite trends)! We love the idea of soft textures that engage the user while adding a touch of luxury. Like all trends, there are many ways to incorporate velvet in your home - from high-end designer pieces to store bought retail items. We like to mix both for a unique look. As the first part of our new “Look For Less” Series we will take a look at the velvet trend and give some examples of how you can achieve the designer look at a lower cost. Take a look at these options for 5 popular velvet styles! A beautiful statement piece for any living room, this piece instantly glams up a space. Plus - we LOVE the brass orb feet of this Jonathan Adler Sofa! The key here is to focus on rich tones that will look luxurious. 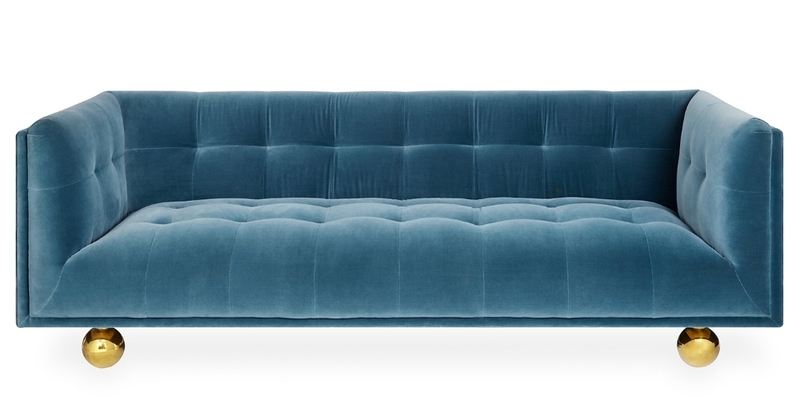 Also, include a sofa with tufting and straight lines to achieve the look of the Jonathan Adler piece. A trend doesn’t always have to be a large statement piece. You can add a subtle addition through accent pieces such as this luxe Brabbu Armchair. We like its mid-century style, angled aged brass legs mixed with the deep green velvet. These alternatives mimic the curved shape, mid-century style and angled legs. This would be the sophisticated centering piece in your bedroom! Straight and curved lines, tufted velvet and a dramatic tall headboard make this Mitchel Gold & Bob Williams bed special. You can keep the drama with a tall headboard, with or without tufting. Other detail options are nail heads, and brass feet. Keep it neutral or go for a bright color such as Chartreuse! This versatile piece could go almost anywhere, from a vanity table in your bedroom to extra seating in your living room. This handmade piece takes on three strong trends all at once: velvet, brass and jewel tones! The angled brass base is a beautiful design detail. Square or round, the brass base of these stools keep it sophisticated and interesting! We must not forget accent pillows! Accents such as throw pillows help bring a look together. This hand-painted silk velvet pillow is gorgeous. Its iridescent effect makes it almost glow. A piece like this would add style to any sofa, bed or chair! There are plenty of velvet pillow options around - some are printed, some embroidered, some dyed and some solid. The fun is mixing and matching! In an ideal world, all of our homes would be complete with every designer piece we desire. But until then, get the designer look for less!